When we think about underwater fluorescence we automatically think about night diving, and that is definitely the best way to see the full range and magnificence of the phenomenon. 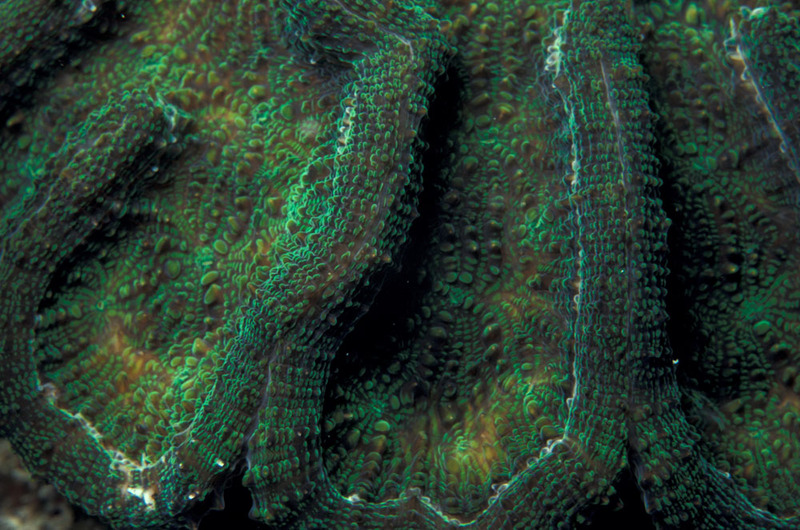 But once you get your eyes and brain tuned to it you will start to notice naturally occurring fluorescence on the reef in the daytime. Divers know that the deeper you dive, the more colors disappear. The reds go first, then orange and yellow, until you are left with a scene that is mostly blue. That is why we use color correcting filters and artificial lights like electronic flash to bring out the ‘true’ colors. But sometimes you will come across an ‘impossible’ color. Red or bright orange at 20 meters. How can that be? Fluorescence. Blue light being absorbed and converted to red. The two picture pairs below were taken by Conrad Blickenstorfer, founder of Scubadiverinfo.com. He noticed these red and orange color at a depth of about 60’ in Saba and rightly suspected it was due to fluorescence. The image on the left in each pair was taken with ambient light and the image on the right with electronic flash. 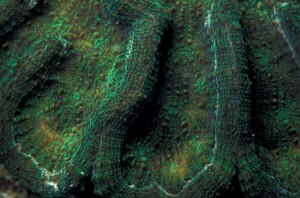 This kind of observation of red fluorescence goes back a long way. One of the first divers to mention it was Luis Marden, a pioneering underwater photographer for National Geographic. In a 1956 article he wrote about red anemones that he saw at 60 feet in the Red Sea. He realized the same thing that Conrad Blickenstorfer did more recently – that the red was impossible, and that the red he saw must have been due to fluorescence. This was confirmed when those red anemones came out a dull brown in his flash photographs – the intense white light completely overwhelmed the fluorescence. You will only see that obvious red fluorescence in deeper water, where red is gone from the downwelling light. 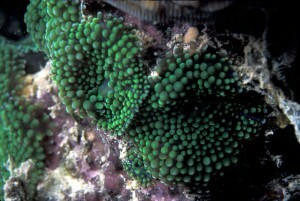 In shallower water you can sometimes see really intense green corals and anemones. 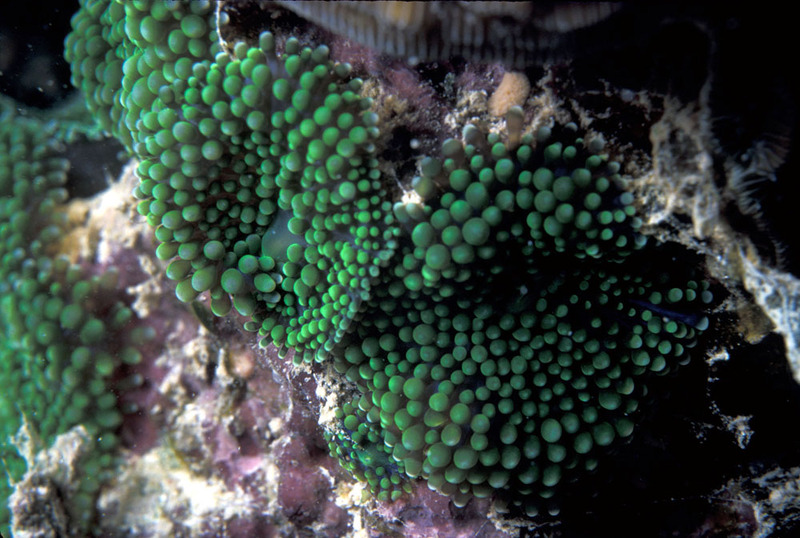 If you’ve done any fluorescence night diving you know that green is the most common and intense coral fluorescence color, and it can be bright enough to make a real difference in the apparent color, as in the daylight pictures below.